Tens of thousands of protestors rallied in the streets of Taiwan on Sunday against president Ma Ying-jeou’s engagement policy with China. Protestors claim Ma’s policies could possibly undermine the country’s self-rule. The march was lead by the chairman of the opposition Democratic Progressive Party, Tsai Ing-wen. The march comes a few days before the anniversary of the president’s appointment, which is due on Wednesday. The opposition claims that Ma will weaken the sovereignty of Taiwan, if he follows through on his pledge to abandon the anti-Chinese policies of his predecessors. China claims sovereignty over the island nation, which split from the former when the Chinese Civil War ended in 1949. China has said numerous times that it will regain rule over Taiwan, even if it means using force. Abhisit Vejjajiva is elected as the new PM of Thailand. Today The House of Representatives of Thailand elect Abhisit “Mark” Vejjajiva Thai: อภิสิทธิ์ เวชชาชีวะ, born August 3, 1964, as 27th Prime Minister of Thailand. Vejjajiva has been the leader of the Democrat Party since February 2005. Following the removal of prime minister Samak Sundaravej in 2008, Abhisit lost the National Assembly vote for Prime Minister by 163 votes to 298 for Somchai Wongsawat. On December 2, 2008, the Constitutional Court of Thailand decided to banned the three parties including the PPP, which dissolved the governing coalition. Taiwan has arrested former president Chen Shui-bian on charges of money laundering, embezzling government funds, taking bribes and forging documents. Television coverage showed him shouting “political persecution” while being led away in handcuffs. “The KMT and the Chinese Communist Party see me as their number one prisoner as I am the biggest stone blocking their way to reunification,” Chen said according to reports. However, court proceedings were halted and authorities took him to a hospital after he requested medical attention. 2008 COMPUTEX, famed as the 2nd-largest ICT trade show in the world has some special features this year including “Design and Innovation Award of COMPUTEX”, set to discover innovative designs world-wide, “Environment-related topics”, highly respected by environmentalists and industrial businesspeople with many ICT products related to energy-efficiency and green technology showcased at “Mega Trends Pavilion”. Today, Ma Ying-jeou was sworn in as the President of the Republic of China, also known as Taiwan, and delivered his inauguration speech, entitled “Taiwan’s Renaissance”. In his speech, he discussed four issues. 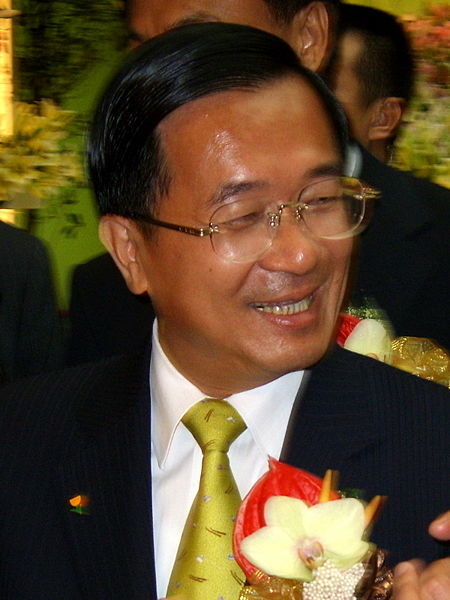 He called for people to “establish mutual trust and Seek common ground while ignoring differences, setting aside disputes, and creating a win-win situation”, which was also promoted by Jintao Hu. Ma also stressed three of his principles “No reunification, No independence, No war”. He also said, he hopes the governmental executives of China can positively appreciate “one China, but agree to differ on its definition under the 1992 consensus”. The Pentagon made a public statement on Tuesday saying that four ICBM detonation fuses were accidentally delivered to Taiwan by the United States military back in 2006. Ma Ying-jeou, former Mayor of Taipei, has been elected as the new President of the Republic of China (Taiwan) in the fourth contested election of the independent state with a landslide victory of 58.45% of the popular vote (7,658,724 votes).